ike Canadian history, the history of instrument making in Canada is relatively short. 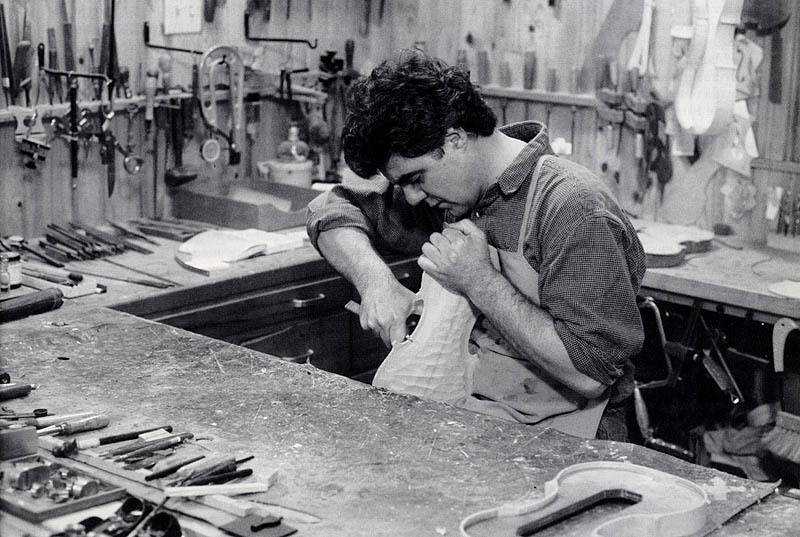 Using a penknife, Denis Cormier shapes the soundboard of a stringed instrument, 1991. We know that one of the first musical instruments was made in colonial times. The Quebec cathedral commissioned an organ by sculptor and cabinetmaker Paul Jourdain, who delivered it in 1723. Some one hundred years later, there were a number of established instrument makers, such as Joseph Casavant, a blacksmith by trade and a self-taught organ builder. In 1879, his sons, Samuel and Joseph-Claver, established the Maison Casavant Frères. Among the other instrument makers to achieve prominence in Canada during the nineteenth century was Samuel Russell Warren, who settled in Montreal in 1836 and became the country's first professional organ builder. As for stringed-instrument making, only in the late eighteenth century is there evidence of the first artisans and restorers. Around 1820, a self-taught luthier, Pierre-Olivier Lyonnais, became the first of four generations to make instruments of the violin family. The Bayeur brothers of Montreal, followed by Camille Couture, also of Montreal, were the first luthiers to establish an international reputation, during the 1920s. The first half of the twentieth century is marked by several outstanding names, for example, George Heinl and George Kindness of Toronto, James Croft of Winnipeg, and Frank Gay of Edmonton. Piano making began in Québec, thanks mostly to artisans of German and British origins. Frederick Hund was the first piano maker to carry on his trade in the city, in 1816. A number of other piano makers, including Thomas D. Hood, achieved success in the first half of the nineteenth century. In 1851, there were four piano makers in Toronto, ten in Montreal and three in Québec. From the time of Confederation to the turn of the century, several piano manufacturers prospered, including Heintzman, Mason & Risch, R.S. Williams, Willis, and Lesage. However, few of the firms survived the 1930s depression. By 1980, only Heintzman and Lesage pianos were manufactured in Canada. Instrument making underwent a revival in the late 1960s, in the wake of renewed interest in early music. The movement led to the establishment of musical associations and ensembles, which further encouraged luthiers and other instrument makers. The 1970s were marked by the vitality and know-how of several luthiers, particularly Ray Nurse, Michael Dunn and Edward Turner in Vancouver, Otto Erdész, Jean-Claude Larrivée and Matthew Redsell in Toronto, Antoine Robichaud and Hubert Bédard in Montreal, and Joseph Kun in Ottawa. All these artisans contributed in various ways to the revival of instrument making in Canada. This section of Opus focuses in particular on the making of guitars and instruments in the string quartet, admirably represented by the works of twelve luthiers and four bow makers. As is the case throughout Opus, there are occasional references to the European luthiers who inspired the instruments presented here.